As I am still gathering ideas and thoughts (and time!) for my next feature blog, here is some more new music for you. Today I have decided to share with you a DJ Set that was recently recorded live from Nike Town in London. 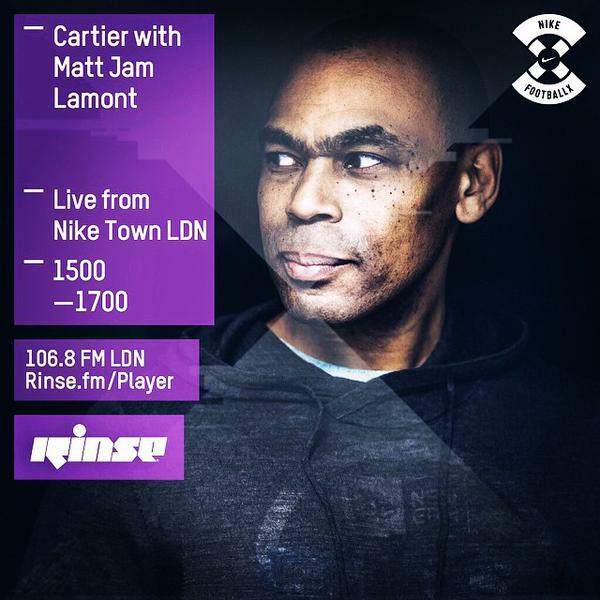 It features DJ Cartier alongside Matt Jam Lamont representing Rinse FM, doing what they do best. Since my early days of listening to and making music, I have grown up with the sound that we can very much call our own – UK Garage. I’m glad to say it’s still going strong today. I love the fact that a radio station has decided to bring their DJ’s into the public for a week of live sets. This allows people to truly feel what DJing is all about and maybe inspires them to give it a go themselves. My hat goes off to Rinse FM!